I love to be creative with my jewelry and accessories so I thought that the idea of switch snap charm jewelry was brilliant and innovative. Jane Jane Jewelry has designed a beautiful collection of switch snap charm jewelry which allows me to mix and match my pieces to create tons of different looks. A few months ago, I had the opportunity to review a switch-snap jewelry necklace from Jane Jane Jewelry and I absolutely LOVE it! Therefore, I was really excited to be able to switch out the pieces with new charms and the black leather bracelet. 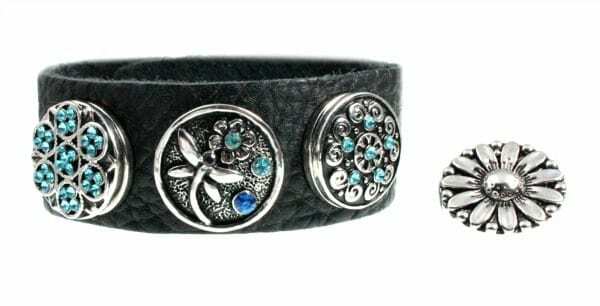 The Black Leather Bracelet with Dragonfly and Crystal Snap on Charms (SRP $29) is a pretty, modern piece that comes with 4 snap on garden themed charms i.e. a turquoise crystal dragonfly, a crystal swirl charm, a daisy flower and a stylized flower charm. The leather bracelet is so soft and supple so it feels quite comfortable to wear allows for 3 charms to be added and the extra included is the perfect way to switch out looks. I love that all of the charms are designed to be able to be worn with the snap rings and necklaces too……how neat is that?! How does it work? It is very easy to create my bracelet as I simply decide which charms would work with my outfit to complete the perfect look and then push the button snap onto the piece of jewelry. Each charm fits perfectly into the button snap and stays securely in place until I want to change it out. There are lots of lovely, fun charms to choose from and an infinite amount of fashionable looks. You are invited to visit Jane Jane Jewelry to browse the entire collection of switch-snap snap button jewelry! I like the Caribbean Blue Murano Glass Bead European Charm Bracelet! I would have to say it is the Long and Short Layered Chain Necklace to Wear 2 Ways found in the Boho Festival Ethnic section. I love its versatility and style. Very pretty. So many beautiful items. I really like the Custom Size European Charm Bracelet – Flower Murano Glass Beads. Gorgeous! I like the Sterling Silver Kitty Cat Charm. Edgy Hematite Beaded Long 5x Wrap Black Leather Bracelet is my favorite. I like the Square Cut Garnet Sterling Silver Pendant 18 Inch Necklace. I love the Amethyst Dragonfly Design Sterling Silver Pendant. I really like the Stretch Ring with 1 Purple Crystal Snap On Charm, it’s simple and cute. I like the Caribbean Blue Murano Glass Bead European Charm Bracelet.